Well, here's an interesting note...we weren't expecting to hear that Andy's Mom would make her return to Toy Story 4 when Julie stumbled across this video of Laurie Metcalf's interview on Watch What Happens Live (our full post is here). Watch the clip below - were you as surprised as we were hearing the news? 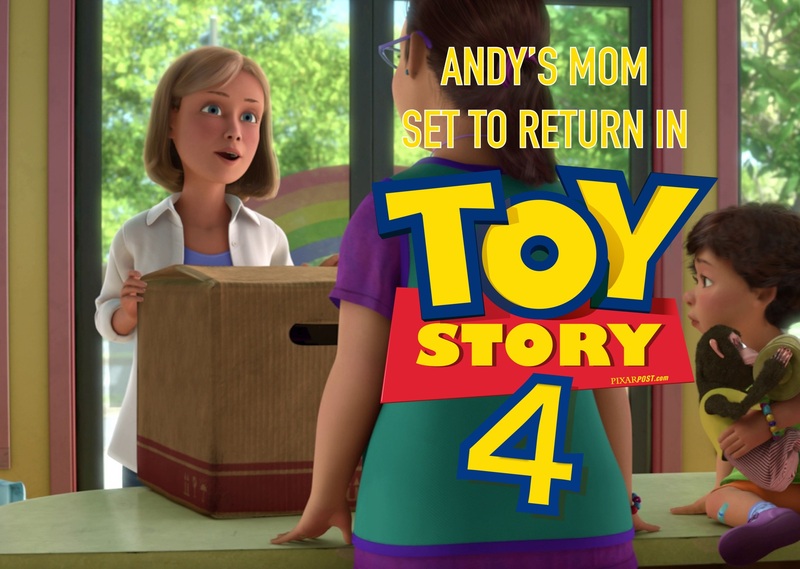 Will Andy's Mom have a big role, will she just make a brief appearance, or will her appearance only be tied to a flashback scene looking back at the toys lives? Most likely it'll be connected to a flashback concerning Bo Peep (probably off-screen during the events of Toy Story 3 or in-between the time skip for TS2 and TS3). If Andy's Mom is set to return, her name is actually Ms. Davis, I think that would be pretty cool. Like VioletParrFanatic1989 said, I think she will most likely appear in a flashback concerning Bo Peep that Woody has. But who knows she could make an appearance other ways as well. There are endless possibilities and with John Lasseter at the helm of the film, there are even more possibilities. Who knows what Pixar could bring us. She could have a very brief appearance (which I think is likely), kind of like a Stan Lee cameo in a Marvel film, or she could have a huge role as a human character. Interesting! Have any other characters besides Andy's Mom, Woody, Buzz, and Bo Peep been confirmed so far? ReptilePatrol, no not yet. Although I do believe fan favorites like Jessie, Hamm, Potato Head, Bullseye, Aliens, Rex and Slinky Dog will make appearances in the film. The characters I want to see in this film are the prospector Stinky Pete, and my favorite growing up Wheezy! Potato Head (Don Rickles) and Trixie (Kristen Schaal) have also confirmed their return to the film. I also agree with the others that Andy's Mom will be back for a brief flashback as we may see what happened to Bo Peep. Hm since Lotso's my favorite Pixar villain I'm divided over whether I'd like to see a cameo of him or not, like with Sid. Whether he'd still be stuck on that truck (lol) or if he'd ever enjoy being with the new owner like how Sid seems to be content with his trashman job and Stinky Pete would probably eventually like his new child at the end of TS2. I wonder how old that girl who found him would be by this point in the story? But anyway, there are so many toy characters now there's no telling what old/new ones will show up. The regular gang plus Bonnie's gang are a given to appear and that's already a lot of characters to juggle in one movie. But the large casts are the reason I enjoy Pixar's works like the Toy Story and Monsters series so much. Same with Finding Nemo. Flashback sequence, is probably the No. 1 option. I've read lots of articles about Andy's moms return and lots of the articles agree with us, that the flashback sequence is probably the way Pixar is going to go. Who knows maybe we could see a young andy in that flashback sequence. They could just use archival recordings, from previous Toy Story films for him. This is the upcoming Pixar release I am most excited for, although I am really excited and pumped up for Finding Dory, Cars 3, Coco, and The Incredibles 2. It should be interesting to see how it plays out! But I'm 99.9% positive Pixar won't disappoint, no matter what they have in store for us!